Although it is temporary, pulseless ventricular tachycardia does threaten your life. It is essentially a very rapid heart rate for a short period of time and if you do not receive timely treatment for it, you can die. If you are at risk, it is a good idea to be aware of what this condition involves as well as the potential causes, so you can do your best to prevent it from occurring and save your life. As mentioned, pulseless ventricular tachycardia is life-threatening. This cardiac emergency will lead to death unless it is treated timely. Tachycardia is a rapid heart rate of more than 100 beats in a minute. The word, ventricular, is a rapid heart rate that is initiated electrically by the ventricles or lower chambers in the heart, which is in comparison to the typical control center within the atria. The final term, pulseless, refers to the lack of a pulse, which means the typical amount of blood that is ejected during each heartbeat is absent. This occurs because the ventricles pump incredibly quickly and this rate does not match that of the atria. When you combine these terms, you understand that in pulseless ventricular tachycardia, your heart's large ventricles temporarily pump very quickly but without the desired effect. This condition is a temporary because it is impossible for it to keep going and for someone to be alive at the same time. Although the heart continues to move, it does not actually beat, leading to a lack of oxygenated blood circulation. The result is that the heart, as well as other organs and tissues, will not get enough oxygen-rich blood. If you have low oxygen concentrations, known as hypoxia, there will be tissue and cellular death in a matter of minutes. A person with pulseless ventricular tachycardia will develop ventricular fibrillation, which is what happens when the heart quivers. On an EKG machine this turns to the asystole or straight line that you see. There are many possible medical conditions that can give a person an increased risk of developing pulseless ventricular tachycardia. A major factor is a previous heart disease, causing tissue death by the electrical conduction pathways of the heart. Experts believe that sustained pulseless ventricular tachycardia is frequently preceded by self-limited, short runs that are six beats or fewer on at least one occasion. Hypoxia and hypokalemia may also lead to the development of pulseless ventricular tachycardia. Hypoxia is when there is low oxygen and can lead to damage of the cardiac electrical functioning at higher levels. Hypokalemia refers to low serum potassium levels, leading to irritable ventricles. Here are three great ways to help you manage pulseless ventricular tachycardia. Continue reading and know how to save your life when things are at stake. When treating pulseless ventricular tachycardia, you should use the left branch of the standard cardiac arrest algorithm. This branch involves cycles of CPR (cardiopulmonary resuscitation) and shocks. Using this algorithm is the best method of restoring spontaneous circulation. When you use this method, you must always be sure to use high-quality CPR until the patient receives the defibrillator. You also need to minimize any interruptions in the chest compressions and aim to use the defibrillator rapidly. A manual defibrillator is ideal as opposed to an AED (automated external defibrillator). That is because using an AED may lead to prolonged interruptions to the chest compressions for administering the shock and analyzing the rhythm. The algorithm doesn't use stated shocks and there are 5 cycles of CPR between each shock. The majority of defibrillators you will find today are biphasic. This means that they involve the electrical current, starting in one paddle before moving to the other and then returning. This type of shock needs a smaller amount of energy to restore the normal rhythm of the heart. Experts also think it reduces cellular damage of the heart as well as skin burns. 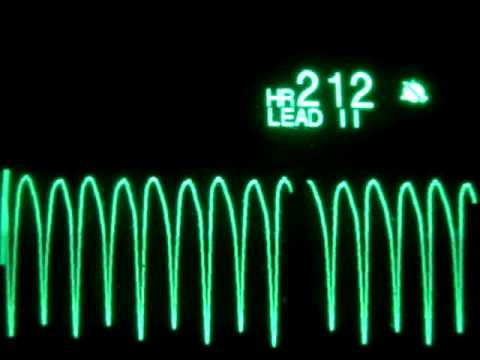 Using a biphasic defibrillator for pulseless ventricular tachycardia will require a shock dose of between 120 and 200 Joules. Therefore, you should start on the low end and increase the dose in steps if needed. Remember that shocking should be announced to ensure everyone's safety with statement like "I will shock on three, so everybody should be clear before three." One type of medication used to treat pulseless ventricular tachycardia is a vasopressor, which produces vasoconstriction and increases blood pressure. The effective ingredients in vasopressors are vasopressin and epinephrine. Each of these is used because of their vasoconstrictive effects which help with CPR by increasing blood flow to a person's heart and brain. There are antiarrhythmic drugs such as magnesium, lidocaine and amiodarone that can be used as part of the algorithm for pulseless arrest as well.